The MAMA Conference 2013 is set to be our best yet! We are proud to present such a high calibre of keynote speakers, session leaders and a fantastic wide-ranging subject matter. At MAMA Conference we prefer to let the common theme of maternity run as our binding thread and hope that our diverse content appeals to a wide audience. In general, we like to cover the biology, psychology, politics & practice of maternity care. For 2013 the conference will be held at the Assembly Rooms in Edinburgh on 26th & 27th April. It's a fantastic venue, which means we can build on the successes in the past & make this conference even bigger & better. So to find out lots more and to book your place, click on the links in the April 2013 menu above. 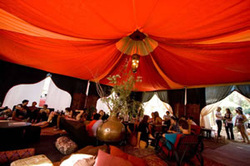 all will be revealed over the coming months, but come prepared to experience the 'red tent'! Shiela Kitzinger, Soo Downe, Sheena Byrom, Joy Horner, Michel Odent, Amali Lokugamage, Mary Steen, Kathryn Gutteridge, Kerstin Uvnas-Moberg, Margaret McCartney, Clare Willocks, David Hutchon and Ina May Gaskin. Unfortunately we can not cater for children under the age of 16 at our conference, however, if you are breastfeeding a baby up to the age of 12 months you are still welcome to attend with them. We will try to set aside a special mother & baby room for feeding, changing & escaping the throngs as & when you wish. We do request, however, that you respect the needs of the other delegates in attendance & immediately leave the conference/session room should your baby become noisy or disruptive. If you have any further questions or queries then do please get in touch. Have you tried Friend Funding? Fancy coming to the MAMA Conference but can't quite afford it? Not even with the Pay Monthly scheme? Well, why don't you try Friend Funding your place! Create a pot online, link it to your facebook account & invite your friends & family to contribute instead of buying you a birthday or a Xmas present this year. Click below to learn more & set up your MAMA Conference Friend Fund.